See Video and Photo Gallery below. 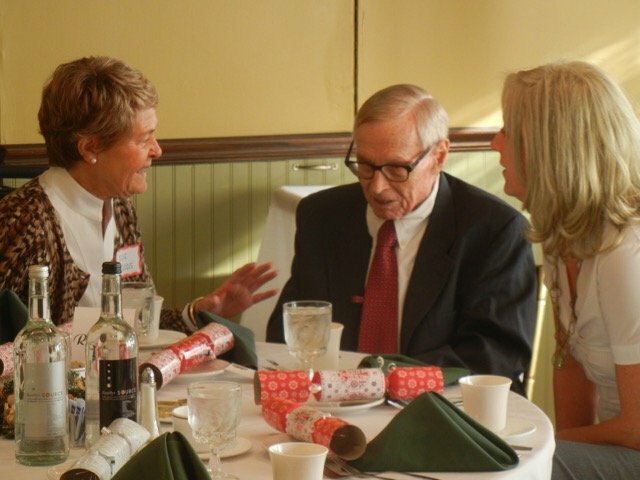 A delightful afternoon was had by all as the Welsh Society of Western New England gathered at the Yankee Pedlar Restaurant in Holyoke, MA on December 5th for their annual Christmas luncheon. Welsh-born Rev. Hugh James, now rector of Christ Episcopal Church in Norwich, Connecticut, gave a fascinating talk and slide presentation entitled “Perlau Llanfihangel-ar-Arth”, or “Pearls of Llanfihangel-ar-Arth”, located in West Wales, where he had been a Vicar at St. Michael’s Church for 12 years starting in 1992. He shared stories both personal and historic in tracing the history of his former Welsh parish which started in 1660 with Vicar Owen Jones. Intertwining political and religious history beginning with the departure of the Mayflower in 1620, Civil War from 1642 to 1651, restoration of the Church of England in 1660, the creation of the Book of Common Prayer in 1662, the Methodist revival with John Wesley in the 1700’s and other significant events, he showed what created the Church of Wales today. Slides of particular historic interest were of two ancient stones that had been dug up in the churchyard: the Latin inscribed Ulcanus stone possibly dating back to the 4th century, and a Celtic altar stone with six crosses possibly dating back to the 6th century, both stones now in St. Michael’s vestry. 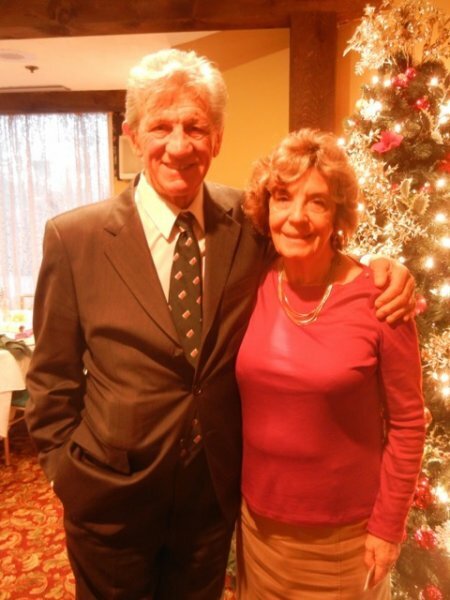 He also spoke of those doing genealogical research relating how difficult it can be to find an ancestor without more details than just a name. He related a story of a family seeking their roots only to find ten graves with the same name in the churchyard. An individual of particular note in recent times highlighted by Rev. James was a former school teacher, Miss L. V. Jones, a member of his church who had taught generations of students, shaping their lives, and was in a sense, a living source of who’s who in this region of Wales. 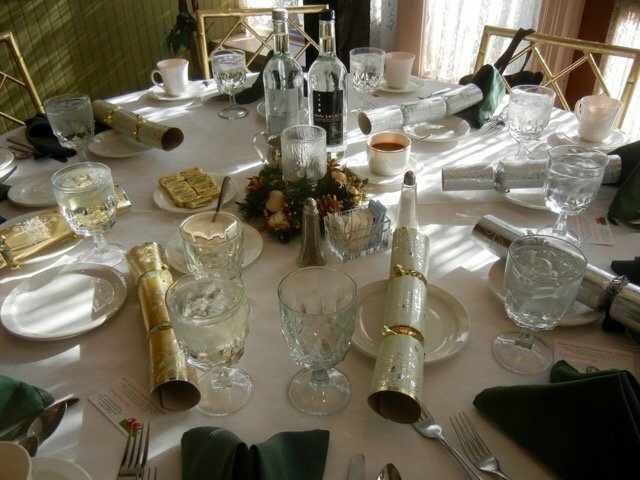 We were transported in time to Wales, the beloved home and ancestral home to many at this festive Christmas luncheon. Much sought after Welsh raffle baskets enlivened the afternoon as well as many items from Wales which were for sale, including books old and new, such as the recently published Ginger Biscuits, A Memoir: Out of Wales and into the World, by Glyn Dowden, a member of the WSWNE. 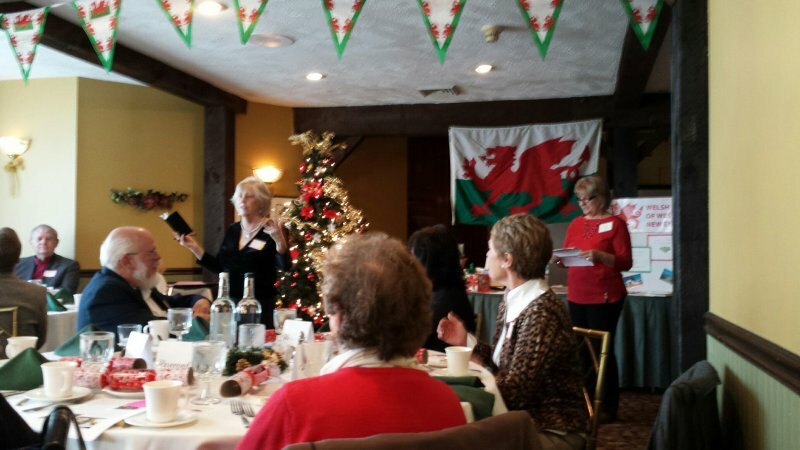 The Welsh Society of Western New England is always seeking new members to enrich our meetings with tales of old and present day news. Contact the Society’s president, Susan Davies Sit at WelshWNE@gmail.com. HUGH JAMES'S TALK ON "PERLAU LLANFIHANGEL-AR-ARTH"